Peter Busfield : another hidden gem – 365posterblog. I was browsing at my Monday Antiques Fair and spotted a rare gem from the corner of my eye ! Unfortunately for me another customer was already keen and rather than degenerating into a Harrods sale type scenario, I let her have it hmmmmmffffff !!! But yet again I sidelined into a search to find out more about the artist : Peter Busfield. After the RAF, and training briefly as an architect, he went to Bradford Art School. Here, he enjoyed his 15 minutes of fame. As the paper described at the time, “bushy-haired Peter Busfield of Ghyllwood drive” beat 20,000 entrants to win a national competition organised by the royal society for prevention of accidents. He designed a road safety poster. 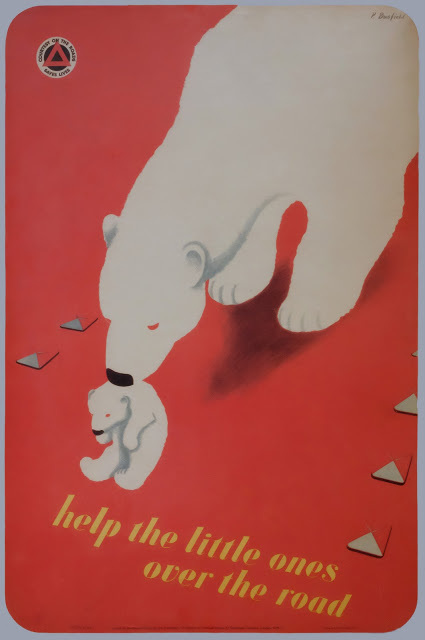 Brumas, a polar bear cub, had just been born at London Zoo, and featured on the print, which is on the back of your service sheets. Dad’s family was rightly very proud and apparently his minor celebrity status apparently inspired the young David Hockney. He then enjoyed a successful career with Sharps, Fields, Alf Cook, Waddingtons, and as a self-employed commercial artist producing many wonderful cards, selection boxes, Easter egg boxes, place mats, pub signs, football pennants and even a large sculpture made of keys for Bradford & Bingley Building society in York. So I managed to link in Hockney to this story which is a joy !